Kimi Raikkonen says he has no intention of boycotting the German Grand Prix, despite the Grand Prix Drivers’ Association’s threat. The Formula 1 drivers’ body, of which Raikkonen is not a member, met on Thursday and issued a statement saying drivers would withdraw from the race if there were similar tyre problems to those suffered in the British Grand Prix. Raikkonen, who was one of the drivers who withdrew from the 2005 United States Grand Prix following the tyre drama, says he will race on Sunday regardless of what happens. “I haven’t seen it, I heard,” said Raikkonen of the GPDA statement. “I am sure it is not going to happen anyhow. Raikkonen said he had no fears about the tyres, even before Pirelli introduced the revised ones for this weekend. The Finn agreed with Pirelli that other teams were using the tyres wrong. “I would race. The problems are not just because of the tyres – there can be a lot of influence in why it has happened. “We haven’t had a single problem all year, so I have no feeling. [Motor racing] is dangerous anyhow, anything can happen. Kimi Raikkonen declined to hit back at Niki Lauda on Friday, despite the F1 legend calling him a “wimp”. The 2007 world champion was then told by the interviewer for Tagesspiegel newspaper that Lauda had said ignoring Red Bull’s offer of a 2014 seat would make him a “wimp”. “I don’t care what he says,” said the Finn. “He likes to talk a lot and that doesn’t concern me. 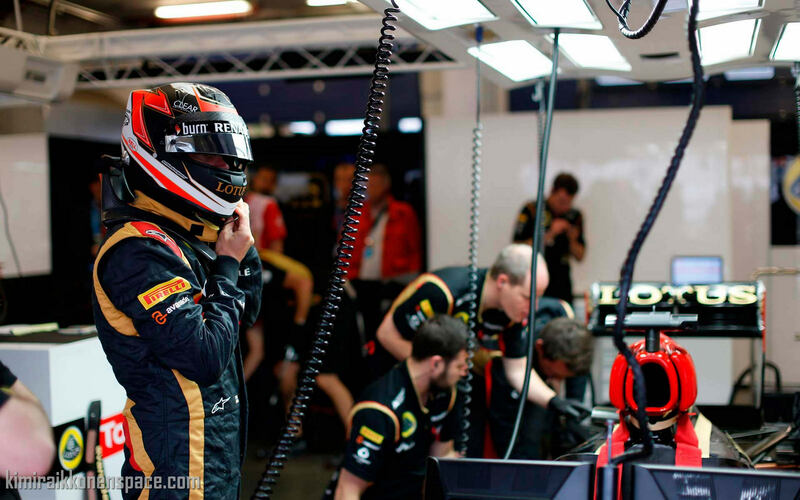 “He’s not being nasty, I know him well enough to know what he’s thinking,” added Raikkonen. The 33-year-old insisted he only returned to F1 in 2012 to win again, so the interviewer is curious as to why he would apparently hesitate to join Red Bull — the dominant team of the past few seasons. “There are many reasons,” answered Raikkonen. “Nothing is as clear as it seems. “At the moment I have nothing for next year. If there is a decision, I will tell everyone,” he added. Asked if a great car, lots of money, or lots of free time are most important to him, Raikkonen admitted: “Everything. The whole package. “I’ve been in a lot of teams and so I know what I want. Asked if the likely friendly pairing with Sebastian Vettel next year could sway things in Red Bull’s favour, Raikkonen insisted: “That doesn’t matter. Kimi is so cool! A pro!! So nice to see that Kimi talked that much ysterday, guess the mood was there,lol. I dnt think the threat of the GPDA is a nice thing especially for those who will be attending the race tomorrow. I’m happy that Kimi has said that he will race whatever happens, for sure this hasn’t pleased the other drivers particularly Jenson i suppose, but Iceman is his OWN MAN. the Mclaren guys nearly beg him in Indianapolis 2005 to take the pitlane, dnt think Kimi will boycott another GP that soon. Paul Hembery should have been all smile when hearing what kimi said concerning the wrong way teams were using the rear tyres. Kimi The Wise.